Learn everything you need to know about your 4 month old baby. Track important developments and milestones such as talking, walking, growth, memory & more. Your baby won't crawl for another few months yet, but in all other ways she's busy as a bee from dawn till dusk. In addition to mastering her rollover skills -- she might be flipping in both directions now -- she might be able to sit up in a tripod shape, with her hands in front of her for balance. On her tummy she can extend her arms and legs and rock from side to side or get around a bit by rolling, shimmying, or twisting. Put her on her back and she'll kick against any flat surface nearby -- or jam her toes in her mouth. Anything within reach is fair game for grabbing, mouthing, waving, and moving from hand to hand. Physically, she's a dynamo. Mentally she's a wonder too. 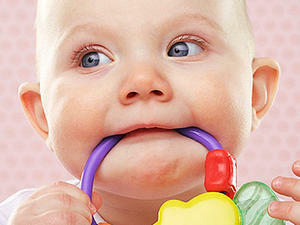 Five-month-old babies are tireless explorers, interested in anything that's going on around them. They'll turn toward engaging sounds, watch objects as they disappear from view (and try to figure out where they went), and touch and mouth all kinds of toys -- and less-savory items too. An increased attention span, coupled with alert periods for up to two hours at a stretch, give babies more time to learn. Plus, they're becoming genuinely social, imitating your facial expressions and making faces of their own, including disgust at a not-so-tasty new solid food or joy when you walk into the room. Solid foods are the perfect venue for playtime exploration: squishy, tasty, and excellent for sucking and biting. Because your baby's eating more solid foods, she'll be taking in less milk -- and the nursing or bottle-feeding sessions she does have will be increasingly distractible, as people-watching becomes more interesting than eating. It's enough to make you wonder whether now's the time to wean. Pediatricians recommend breastfeeding for the entire first year if you can, but if you decide to wean -- or want to add bottles into the mix -- experts recommend doing it gradually over a couple of weeks. Start by replacing one nursing session a day with a bottle -- and have Dad or a caregiver give it to her at first. Why? Because when your baby smells your milk (something she's keenly attuned to) she might flat-out refuse any alternative, even if it's a bottle of your familiar breast milk. Gradually you can replace a few additional nursing sessions with a bottle. Be prepared for resistance, but keep at it. Sooner or later she'll make the change. Though you won't have a well-baby visit until 6 months, keep an eye on other potential problems this month. You might be concerned about hearing issues, for instance, if your baby seems unresponsive to her name or to the sound of your voice; add it to your list to ask your pediatrician about at your next appointment. Similarly, if you notice an ongoing onslaught of coldlike symptoms, it could be environmental allergies -- another thing to ask your ped about. 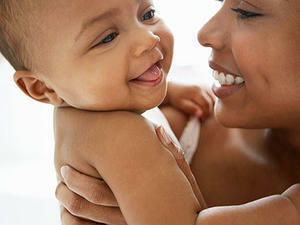 A baby who eats solids and loves to explore equals a messier house and an overload of chores for you and your partner. That's not anyone's idea of fun, especially when cleaning up cuts into cuddle time, so adopt a few smart tricks to streamline the process. Institute a 10-minute pickup. No matter how many times you put things away during the day, by bedtime more toys have been scattered, more rice cereal has been flung on the cabinets, and more diapers are spilling from the pail. Set a timer for 10 minutes and, with your hubby, clean up as much as you can before the buzzer dings. It's long enough to make your house look presentable so you can relax at night, but it won't knock you out with exhaustion. Wash and go. Who has time to hand-wash a stuffed animal? Cut germs and save time by culling the nonwashable toys from your collection, running everything else through the washing machine or dishwasher, and forgetting about it. Prevent messes. Throw a plastic tablecloth or a splat mat under baby's high chair, so all you'll have to do is shake it out and drop it in the washing machine after particularly messy meals. Contain toys. 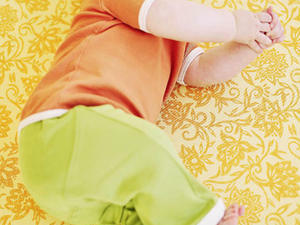 If you have older kids, you'll notice that babyproofing is a lot harder now, with all those small toy parts scattered everywhere. Explain to your kids that putting their stuff away keeps the baby safe from choking hazards. Then make cleanup easier by dumping Legos or Polly Pockets into cookie sheets at playtime; it'll keep toys neatly confined to one place. Or offer a nickel for every tiny toy part they collect in a five-minute period -- and watch them jump to help.